What would an Italian chef do without tomatoes? Think of those two staples of the peninsula’s repertoire pasta and pizza, and it is impossible not to envisage a combination that includes the sweet, juicy red and green fruits reduced in the pan to increase the intensity of their flavour. Indeed, both pasta and pizza both really came of age when this good companion was introduced into the nation’s diet around two hundred years ago. For the best results, always choose the plum variety for a sauce, either fresh or tinned: it contains less water than other varieties and has firmer flesh, both characteristics ensuring that the optimal result is achieved. There are a number of different brands of the tinned variety available both in supermarkets and delicatessens but most food enthusiasts will state without hesitation that the best are labelled San Marzano, particularly if the enthusiast in question hails from the region of Campania, where they grow in the shadow of Vesuvius, close to the city of Naples. The fruit has an intensity that matches the volcanic temper of Vesuvius herself, and once they have sampled them, cooks are very reluctant to use any other variety. Analysing the tomato by its constituent parts, it should be understood that the flavour comes from the flesh; both the water and seeds in the middle and the skin have absolutely nothing to contribute to the success of a dish, hence the reason why when a tin of plum tomatoes is opened, the product inside has already had the skin removed. When using the fresh variety, it is simplicity itself to remove the seeds and the skin. First, make a small cross on the base of the tomatoes with a sharp knife, then plunge them into boiling water for around 10 to 15 seconds (the intense heat makes the skin shrink). Then transfer the blanched tomatoes to some iced water in order to kill the action of the heat immediately, otherwise the flesh will begin to cook. Then simply lift out each tomato individually and peel: the skin will come away with ease. To remove the seeds in the watery centre, slice lengthways and scoop them out with a spoon. This process is ideal for preparing any number of tomato-based salads. One of the most famous tomato salads is panzanella, essentially a peasant dish designed to use up bread which has gone stale. There are a number of variations of the theme, whether the salad is being constructed in Tuscany, Umbria or Campania, but as a basic recipe for four people, peel and deseed four plum tomatoes, cut the flesh into dice and put to one side. Take a clove of garlic, finely slice and reduce to a paste together with two anchovy fillets and a tablespoon of capers washed to remove either the vinegar or the salt that they have been preserved in. Dice half a red onion, then take four slices, or half a loaf, of stale bread and cut into croutons. In a glass bowl, mix all the ingredients together, then add a combination of one tablespoon extra virgin olive oil with three tablespoons red-wine vinegar. Toss the contents of the bowl in order that everything receives a good coating of oil and vinegar, cover with a cloth and leave for a couple of hours to allow the different flavours to infuse. Adjust for seasoning and serve. 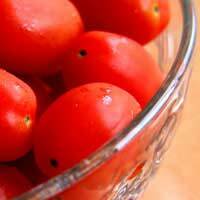 Great advice on peeling and deseeding tomatoes. I was always anti because I believed the flavour was in the seeds and juice. This always made for disappointingly soggy fettunte! It works a treat doesn't it?